The Mega Millions and Powerball jackpots for this weekend’s drawings are both over $US300 million. If the historical relationship between prize sizes and ticket sales holds, there’s a pretty good chance no one will win the jackpot this weekend, but someone could get lucky. This is an interesting week for lottery fans, as both of the big multi-state lotteries have jackpot prizes over $US300 million. The Mega Millions lottery has an estimated prize of $US306 million before its Friday evening drawing, while Powerball has a prize of about $US384 million for its Saturday drawing, as of the time of this writing. 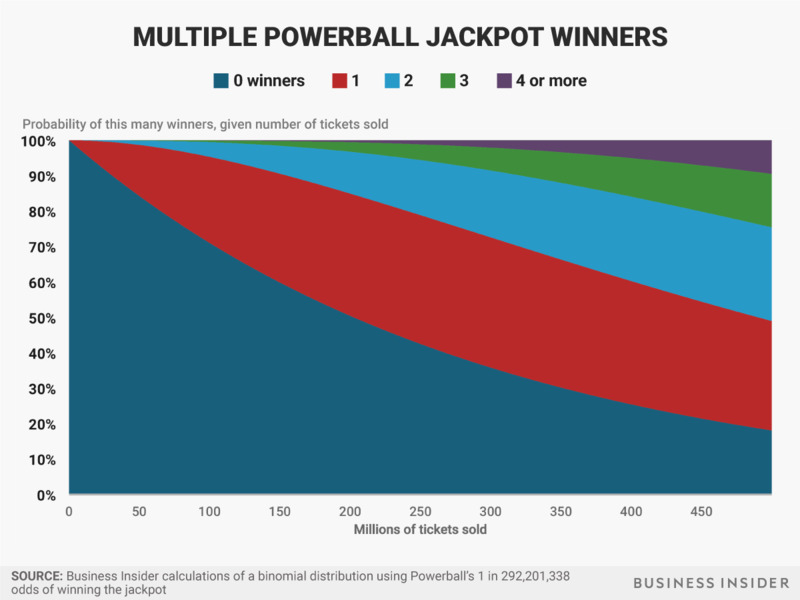 Business Insider looked at why mathematically it might not be a sound financial idea to buy a ticket for one of those lotteries, despite the large headline jackpot prizes. The odds of any particular person winning the jackpot are very slim: 1 in 292,201,338 for Powerball, and 1 in 302,575,350. But millions of tickets will still be sold for chances to win those prizes, and so we decided to look at how likely someone, somewhere in the country will actually win. In our case, the process is filling out a lottery ticket, the number of repetitions is the number of tickets sold, and the probability of success is the 1-in-292,201,338 chance, for Powerball, of getting a jackpot-winning ticket. Using the binomial distribution, we can find the likelihoods of various numbers of winners. It’s worth noting that the binomial model for the number of winners has an extra assumption: that lottery players are choosing their numbers at random. Of course, not every player will do this, and it’s possible some numbers are chosen more frequently than others. If one of these more popular numbers is drawn on Saturday night, the odds of splitting the jackpot will be slightly higher. Still, the above graph gives us at least a good idea of the chances for different numbers of winners. Of course, our above binomial distribution is dependent on knowing how many people actually are buying tickets for this week’s jackpots. We won’t know that exact number until after the draws actually happen. However, we can try to make a guess based on historical trends. LottoReport.com maintains an archive of jackpot sizes and ticket sales for Mega Millions and Powerball drawings. 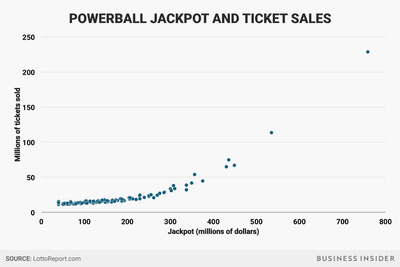 Looking at Powerball drawings from 2017, we can see that there is a relationship between the size of the jackpot and the number of ticket sales. This makes sense – bigger prizes bring more attention and entice more buyers to jump into the pot. Looking at that chart, we can see that lottery drawings in the approximate range of Saturday’s $US384 million jackpot have tended to bring in between around 30 and 50 million tickets sold. If 30 million tickets are sold, the binomial distribution model above suggests about a 90.2% chance no one wins and the jackpot rolls over, a 9.3% chance of exactly one winner, and roughly a 0.5% chance of a split jackpot. If sales are on the higher end and 50 million tickets are sold, that slightly increases the odds of at least one winner. The likelihood that no one wins drops to about 84.3%, the chance of exactly one winner goes up to 14.4%, and the chance of more than one winner remains small at about 1.3%. Of course, there are a lot of assumptions going into those numbers, so they should naturally be taken with a grain of salt. But if those historical relationships hold, this gives us some estimate for the range of likelihoods that someone will win. So, it’s more likely than not, given historical ticket sales trends, that no one will win this weekend, but there’s a decent chance some lucky winner will have a very happy Saturday.